Cyperus tuber (Xiangfu)-Cyperus rotundus L.
Botanical Name: Cyperus rotundus L.
Part Used & Method for Pharmaceutical Preparations: The rhizomes are dug in September or October. They are cleaned and dried in the sun. The fibrous roots are burned away, leaving the rhizomes ready for use. Functions: 1. To promote the free flow of qi in the liver; 2. To regulate menstruation and stop pain. 1. Qi stagnation in the liver manifested as costal pain and stifling sensation in the chest. Cyperus tuber (Xiangfu) is used with Bupleurum root (Chaihu), Curcuma root (Yujin) and White peony root (Baishao). 2. Liver qi attacking the stomach manifested as epigastric and abdominal distension and pain. Cyperus tuber (Xiangfu) is used with Costus root (Muxiang), Citron (Xiangyuan) and Finger citron (Foshou). 3. Cold and qi stagnation in the stomach. 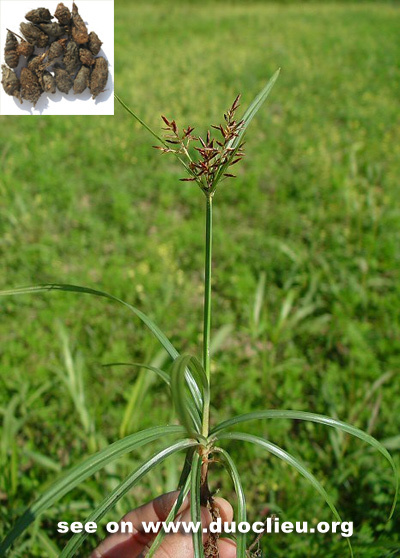 Cyperus tuber (Xiangfu) is used with Galangal rhizome (Gaoliangjiang) in the formula Liang Fu Wan. 4. Cold stagnation in the liver meridian manifested as painful swelling of testicles or scrotum, or hernia. Cyperus tuber (Xiangfu) is used with Fennel fruit (Xiaohuixiang) and Lindera root (Wuyao). 5. Qi stagnation in the liver manifested as irregular menstruation, dysmenorrhea and distension and pain in the breasts. Cyperus tuber (Xiangfu) is used with Bupleurum root (Chaihu), Chinese angelica root (Danggui) and Chuanxiong rhizome (Chuanxiong).